For years, I’ve had 2 rhubarb plants in my back yard. For years, I thought there was something wrong with them. They never ripened, they were always green. So, I never cut them. I just let them die. Year after year. Until this year. I finally realized that I had green rhubarb. Oops. I can’t believe I let 7 years worth of rhubarb just die. Oh well, I guess it’s good compost, right? This year I decided to make what I used to make with my regular reddish rhubarb, Raspberry Rhubarb Crisp. Both are in season right now, so if you don’t have access to these plants in your back yard, they should be easy to find at your local farmer’s market. And if for some reason you don’t like raspberries, any berry will do the trick. Before I make anything with rhubarb, I soften it in the crockpot for four hours. Just cut up the stalks to about 3″ pieces, cover with water, and add 2 cups of sugar. 1. Heat the oven to 350. Combine softened rhubarb, 2/3 cup granulated sugar, and orange (or any citrus) zest and juice in a large bowl. Stir to combine. 2. In another bowl, combine one cup all-purpose flour, 1/2 cup brown sugar, and 1/2 teaspoon cinnamon. Rub 1 stick butter, cut into small pieces, into flour mixture with your fingers until it is well incorporated and forms large crumbs. Add 1/2 cup rolled oats and combine. 3. 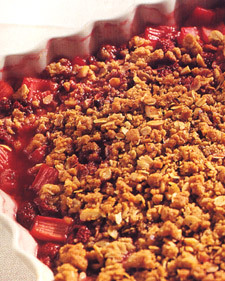 Turn rhubarb into 1 1/2 quart baking dish, scatter berries evenly over surface, and cover with crumb topping. Bake until topping is brown and crisp and juices are bubbling, about 45 minutes. Let cool slightly before serving. Serve with fresh whipped cream.